Welcome to Garden Bloggers' Bloom Day for July 2015. Here in my USDA Hardiness Zone 6a garden in central Indiana, the garden season is in full swing and on those days when it isn't raining, it's nice to go out and see bright, cheerful flowers like the common zinnias. 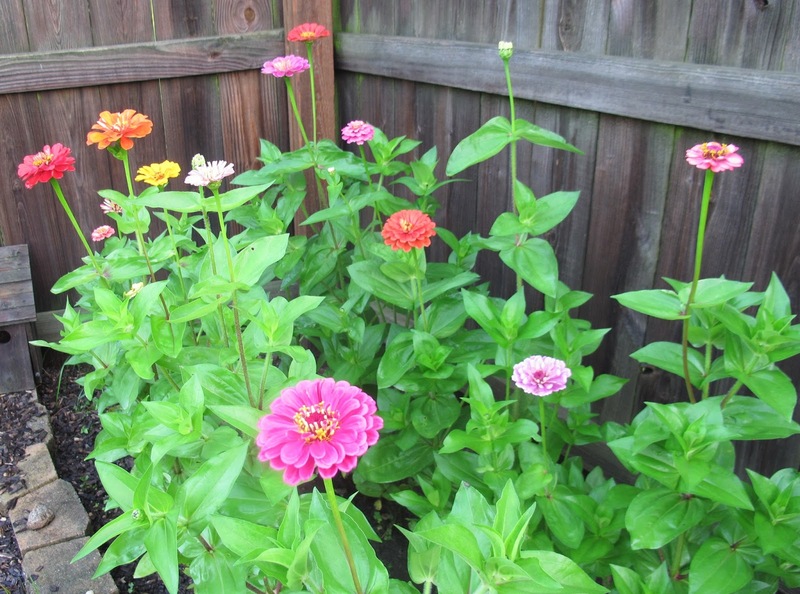 I do believe no summer garden is complete without some zinnias. They come in nearly all colors. I'm growing mine along the fence side of the vegetable garden. Just down from them is a little plot of okra starting to bloom. Out in the rest of the garden the plants are loving the rain and growing as big and lush as I've seen them in many years. In Ploppers Field the day lilies, lilies and coneflowers are putting on a colorful show. Further down the way, I have tall phlox that have grown nearly six feet tall. It's probably a new record and had they been in bloom, I would have shown them to you, but the picture of them just looks like a bunch of overgrown greenery. It's Lilium lancifolium 'Flore Pleno'. I know some people shun orange flowers in their gardens, but who could not want this bloom in their summer garden? Across the way in the border I call August Dreams Gardens, we are starting to see more blooms, right on schedule. That pink bloom is Joe Pye Weed, Eutrochium purpureum 'Little Joe'. The other bloom? Well it is... it is... a sea holly, Eryngium sp. but don't take my word for it and if you think it is something else, be kind and tell me. I do like the view from the other side of August Dreams Border, too. Do you see that tall day lily bud in the picture? I was hoping it would bloom for bloom day, but I guess not. It is called 'Notify Ground Crew' and I thought it would go well with all the other tall blooms in this border because it does have very long bloom stalks on it, up to five feet tall or taller. There are other blooms around the garden, including Black-eyed Susans, Agastache, tall Phlox, Cup Flower, False Sunflowers (but not the real sunflowers just yet), Marigolds, more day lilies, Clematis, lavender and of course, hostas. This particular hosta is 'Praying Hands'. It's been a good hosta for me, with a smaller footprint than many hostas and beautiful lavender colored blooms. What's blooming in your garden as we reach the top of the summit of summer? Join in for Garden Bloggers' Bloom Day and show us. It's easy to participate. Just post on your blog about the blooms in your garden, then come back here and leave a link in the Mr. Linky widget below and a comment to tell us what you have for us to see. Thank you for hosting Carol! Ploppers Field is looking amazing! Happy Bloom Day! Wow, your garden looks fabulous! Enjoyed it immensely. I always think I will plant some Zinnia seeds, and I never get around to it. I hope I didn't mess up your list of visitors--I had a heck of a time with that Mr. Linky thingy. Love the "Praying Hands" hosta! I have to get myself one! Love all the flowers in your Plopper's Field, it is all looking very pretty. Your Zinnias look great - mine aren't flowering yet, fingers crossed for them as I've grown a number of new varieties this year, so hope they come good! Thanks, as ever, for hosting. I'm a great fan of orange. It really stands out even against the strong light at this time of year. Things are really hotting up in the garden, even if the weather isn't. Not in Devon at any rate! Happy Bloom Day Carol and thanks for hosting. I think that your garden and mine are benefiting from some of the same weather patterns. We are getting good rains, and the plants are responding nicely (as are the weeds). I love okra flowers too. Happy GBBD to you! 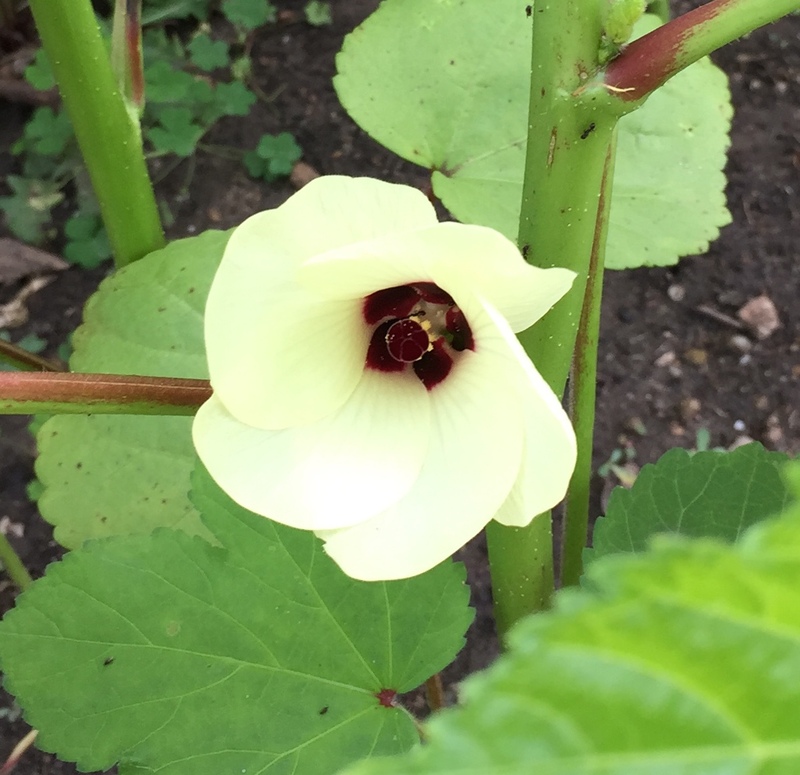 I love the Okra flower - not seen one of those before. It is a bit like my courgette flowers (except that they're yellow) - they hide under the huge leaves too. You have so much this mid-summer! Love that Joe Pye Weed and I agree with others that the Hosta is lovely. Thanks, as always, for hosting GBBD. Hi Carol...your garden is looking lovely in July and I adore your Ploppers Field every time I see it...seems like my garden became one big Ploppers Field since I have not had time to thin and weed....but I love the look....and August Dreams is such a great name for a bed as we look toward all the lovely blooms next month. Lots of rain has helped my garden to flourish this year, so I am grateful for that. Here's to a wonderful month of gardens and gardening and thanks as always for hosting this meme of love! Thanks as always for hosting! Nice to see you have many of the same things in bloom right now. What gorgeous blooms. I love that lily. You are further on than us, my Zinnias won't be in bloom for a while yet. Our gardens are about on the same schedule. Love the over looks of your ploppers and August dreams gardens. The praying hands in my garden are finished blooming but there are many other things abloom. Happy GBBD. P.S. If you wonder why I don't ever put my garden on the Mr Linky I must say I can never get it on. I don't know what I am not doing or doing incorrectly but I can never get my blog to list there. Not to worry, I just wonder why or if there are others who can't seem to master this. Your garden is looking great, Carol! These beautiful summer gardens are our reward for waiting through winter. Here we've had a dry heatwave so some things are feeling a bit stressed. Love those Flore pleno lilies. This is certainly the month for them! Your garden is looking lush! No rain here, sadly. Thanks for hosting GBBD, Carol! Grand Blooms at your place in July! My first Zinnia is School Bus Yellow. If you have Okra Blooms, pods are quick to follow. Oven fried is my fav. Your blog took forever to load on my computer and for one brief second I thought "what if"....what if there is no bloomday post on Carol's blog. Oh my, what a shock that would be. Thankfully all is still right with the world. I love that okra bloom. This would have been the summer to plant them here in Portland as it's been HOT. Maybe I'll give it a whirl next year. I'm not big on orange, but that lily is gorgeous! 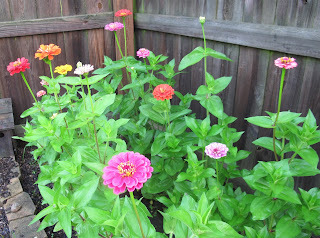 I don't think a garden is complete without zinnias, either, but I'm still waiting for mine to bloom. Thanks for hosting Bloom Day once again, Carol, and let's hope for some sunny days! Hi Carol, I am really loving your dreamy 'August Dreams Garden'. It looks soft and almost like an impressionist painter has waived his magic brush across you landscape. Happy GBBD! Love that August Dreams photo myself. It's always inspirational to see what you've got growing. Wish I could make the acanthus look so dreamy. Sigh just entered the wrong photo for the link. When will I learn. Love your zinnias. They are awesome flowers, so easy to grow. Oooh that Okra flower is so pretty! Love your echinacea too. I have a lot of those as well and love the different varieties and colors! I so agree about zinnias! And that definitely looks like an eryngium to me in your gorgeous August Dreams Garden. I forgot to plant Zinnia 'Aztec sunset' , next year , thank you for the reminder! Wow. I totally forgot until I read another blogger's post. Linking to Monday's Bloom Day. I do like your August Dreams garden! I also have 'Little Joe' and the old standby big guy. They're starting to bud but no blooms yet. I would think mine would be way ahead of yours but it doesn't look like it. Ah, summer blooms - I do love a full, jungle-like landscape and these recent rains have sure given us that here in the Mid-West and Eastern USA! People actually shun orange in their gardens? That's one of my favorite flower colors! That lily is gorgeous. I dont know if my linky added, it might take a while. I had no idea okra produced such a beautiful flower until recently. I was so impressed with it that I added a photo of ours to my bloom day post as well. Wow! I just found this lovely collection of gorgeous blooming gardens, thank you! My little girls take pictures of our blooms weekly and post them so I added the link for this week, they are 8 and 11 and take far better pictures than I can!!! We will be back next month! You have some gorgeous blooms in your garden Carol. Funny to learn that some people shun orange in their gardens. My garden is absolutely chock full of it, thanks to some self seeded Profusion zinnias living up to their name! Your garden is looking so lush! I am growing some zinnias this year, but they are little mites of things, as they are being grown in my new, barely-amended clay garden bed. I am quite impressed at your lilies and love orange flowers in the garden! I have yet to grow lilies at my new place, though, due to all the critters. Thanks so much for hosting! Carol your garden is looking fabulous. Were you really fishing for the name of the not a sea holly next to your Little Joe Pye. It looks like Eryngium yuccifolium, Rattlesnake Master. I have a smoking fungus for Bloom Day in my garden. LOOOVE your August Dreams Garden shots, they're gorgeous! Thanks so much for hosting this!! I could totally get lost in your Plopper's Field. And, until today, I had no idea okra flowers were so beautiful! Ploppers Field is just stunning! I love the okra photo! I've not managed to grow it myself as it's a borderline plant for the UK. Must give it a go though for the flowers alone! Your garden is looking incredible right now. The lily... Wow! I've one similar full of buds waiting to open. Thanks for hosting. Mr linky doesn't like my android phone so will pop back on laptop to put my link. Hey Carol, What a colorful place indeed. I especially love the Zinnias. Hi Carol, I'm posting laster than ever, but I figure it's always worth documenting what is happening. That lily on your site is worth adding to my shopping list. It looks pretty special. Love those zinnias! Thanks for hosting this link up. I have been having a lot of fun gardening this year. I'm sure the mild and rainy weather has helped, but I also am getting to enjoy the fruits of my labor. The shot of your field is great. A garden without orange in the summer is like a garden without summer. I've always enjoyed these posts. I'm late in posting,but hope better late than never. And, I hope I succeeded in getting a link to show up! Thanks for hosting Bloom Day! Your garden is looking wonderful... especially Ploppers! Just joining in for the first time although have read about the Bloom Day on many other blogs! Love the look of your Plopper's Field, so beautiful. I tried to grow Okra here in London, UK, last year but it didn't flower. Looks gorgeous though so worth persevering. I've never been one to participate in your traditional bloom day posts, because every blog post I do is basically a tally of what's blooming at my house. But I do enjoy everyone elses! I don't think I could begin to list everything blooming for a July Bloom Day. Just about everything!